In 1915 wildlife explorer Carl Akeley patented a new type of movie camera that revolutionized the film industry. Nicknamed the "pancake" because of its peculiar rounded shape, it sported an internal gyroscope, which allowed the camera to tilt straight up while the viewfinder remained fixed. 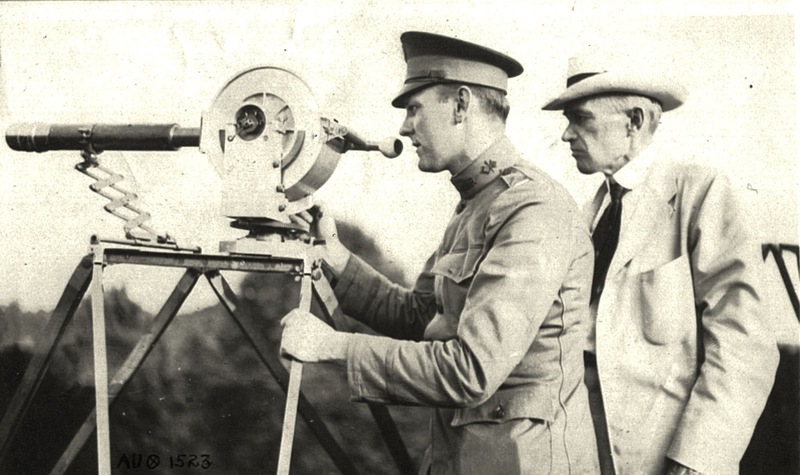 Originally designed for filming outdoor scenes, the camera was quickly adopted by the U.S. Signal Corps when America entered the First World War. A jack of all trades, Akeley was a taxidermist, sculptor, biologist, conservationist, inventor and nature photographer, noted for his contributions to American museums. His major contribution to film history was the "pancake", a lightweight camera that was very popular with newsreel cameramen but that was only when they were able to find one that was still available. 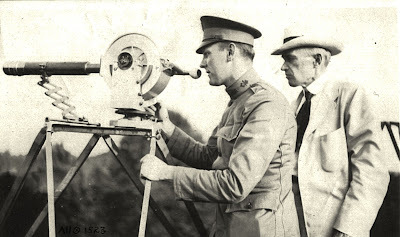 After the American entry into World War I the Signal Corps was most eager to use Akeley's camera and as a result the "pancake" was sold out within a few months. The shutter mechanism was the camera's real claim to fame. The rotary design of the body gave room for the shutter to travel all the way around its circumference. As a result, the shutter angle was 230 degrees. Standard motion picture cameras at the time had a 180 degree shutter, or less. The result of having 50 degrees more shutter is having longer shutter speeds and gaining almost 1/3rd more light than standard cameras. This was important to Akeley because the majority of his filming while shooting wildlife across the globe was during the dusk and dawn hours when lighting was not ideal. This was also where the "pancake" made a huge difference when used by the American army at the western front. With most of the military activities taking place at dusk or dawn under extremely difficult lighting conditions, Akeley's camera proved to be a suitable war film camera both for documentary purposes on the ground and for aerial reconnaissance. According to a press release in March 1918, Akeley had come to Washington, DC, shortly after the American entry into the war to place his camera at the disposal of the newly created Photographic Division. The U.S. Signal Corps soon decided to adopt it as the 'box' for their official war photographers. The first test shots with the pancake film camera for military purposes were made by Signal Corps cameraman Victor Fleming, the future director of Gone with the Wind (1939), as well as Edwin F. Weigle who had filmed in wartime Germany before joining the original team of the Signal Corps Photographic Division. Here is a link to the original photograph, showing Weigle and Akely demonstrating this film camera, from the collection of the National Archives. In January 1915, American cinematographer Ansel E. Wallace visited Oberst Ost, General Headquarters for the Eastern Front in Posen, East Prussia, where he filmed Field Marshal Paul von Hindenburg and his military staff. Long considered lost, his film report has recently been retrieved by the authors in a contemporary German newsreel released by Messter. "An American "movie man" [Wallace] finally induced Von Hindenburg to stand before a movie camera. He did it in a way that made you think of the old J.P. Morgan who wanted to smash every camera he saw. For only a few seconds did Hindenburg walk in front of the movie machine but when that picture was shown in a Berlin theater the audience broke into wild applause. Von Hindenburg is the big man in Germany to-day. As a popular idol he rivals the Kaiser." A conservative and aristocrat at heart, Von Hindenburg must have needed some persuasion to act as a movie star. Films in those days were frequently considered cheap and vulgar entertainment. Until recently, all that remained of Wallace's film was a picture from an advertisement in the American film trade press. A copy of the film recently was found in Messter Woche newsreel No. 16, which was released in Germany in April 1915. The original film is at the Austrian Film Museum. Although part of the footage has been badly damaged the film does clearly show that the German Field Marshal played his part in a distinctly cold and detached manner. Wallace made these pictures at a crucial moment in World War I when Von Hindenburg was plotting against his Chief of Staff, Erich von Falkenhayn, who after the terrible bloodbath at Ypres in November 1914 had lost all confidence Germany could force a decisive battle against the Entente forces. Von Hindenburg insisted Falkenhayn should be dismissed or he would resign himself. In the end the Field Marshal had to back down because Falkenhayn was supported by Kaiser Wilhelm II. Among other reasons, the Kaiser resented Von Hindenburg's growing popularity as the hero of the Battle of Tannenberg. In Wallace's film Von Hindenburg can be seen in the middle, flanked on the left by his second in command General Erich Ludendorff. To the right is Lieutenant Colonel Max Hoffmann, the officer who prepared the master plan for the Eighth German Army to encircle and annihilate the invading Russian forces in East Prussia at Tannenberg in August 1914. Wallace's historical film has been uploaded on our YouTube channel. We added contemporary German music - Prussia's Glory - to the clip.